He doesn’t believe government should be in the business of telling companies how much they have to pay their workers. But Gov. Doug Ducey now finds himself in the position where he is leaning toward supporting a ballot measure that actually would boost the state minimum wage even higher than it is now. It’s not that Ducey thinks mandating companies pay $9.50 an hour by 2020 is a particularly good idea. But Ducey said the measure, being pushed by the Arizona Restaurant and Hospitality Association, would preclude an even bigger evil: Allowing Arizona communities to set their own minimum wages even higher than that. But it is the question of what should be the state policy on wages that is the most immediate issue. Prior to 2006 Arizona employers were subject only to federal wage laws, with its $5.15 an hour minimum. That year voters approved creating a state minimum wage of $6.75 an hour. But the difference between Arizona and the feds does not stop there. 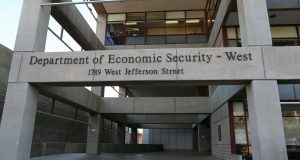 While it takes an act of Congress to boost the federal wage, the Arizona law requires annual increases tied to inflation. The result is that Arizona employers now have to pay at least $8.05 an hour; the federal wage is at just $7.25. Of greater concern to some business groups is the Arizona law specifically allows local communities to create their own “living wage’’ ordinances with even higher figures. And a group in Flagstaff already is seeking a vote to set the minimum wage there at $15 an hour by 2021. So the restaurant group is asking legislators to put a measure on the ballot that would preempt such local options, essentially asking voters to override what they approved in 2006. But recognizing the difficult of that, they have added a sweetener: Wages would go to $9.50 an hour statewide by 2020. And the move would preserve the inflation indexing, albeit with a one-year delay. How much more than $9.50 figure might be than what otherwise will occur automatically is hard to predict as it depends on inflation. Assuming 2 percent year-over-year growth and a requirement to round to the nearest nickel, the current law would bring wages in Arizona up to about $8.70 by 2020. But tipped workers actually could do worse under the restaurant association proposal because of a change in how the industry wants to calculate their non-wage earnings. As a ballot measure, Ducey would not have the option to sign or veto it. But his position could affect what voters do. And the governor acknowledged the difficult of deciding a position. And he acknowledged that the restaurant proposal, which he wants to study further, would push up wages even higher than what they otherwise would be. But the governor said he worries about not preempting local options. “What I’m opposed to is a patchwork of different wage laws around the state,’’ he said, saying it makes it difficult for companies with multiple outlets to operate in Arizona. 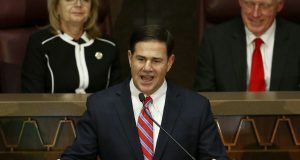 Ducey brushed aside questions of whether local options make sense, given that it’s more expensive to live in some communities like Flagstaff than in others. “What I want to see is everyone make more money than the minimum wage,’’ the governor said. And he said the problem of what companies have to pay should take care of itself. Ducey said he sees current federal laws on a 40-hour work week and time-and-a-half pay for beyond that in the same light. “I think it really depends on the job and the business,’’ he said. The governor said there are many jobs that “aren’t so much punch-in and punch-out,’’ where greater flexibility should be allowed. And he said that works both in the interest of the employer and the workers. Ducey’s comments come as the Obama administration is pushing changes in labor rules that actually would require employers to pay overtime to more workers. Right now, for example, someone who is a manager is ineligible for automatic overtime pay if he or she earns $23,660 or more. The new proposal would raise that figure to $52,000, a move that could affect five million workers. How about a gubernatorial wage set at 200% of the prevailing minimum wage, thereby acknowledging Mr. Ducey’s exceptional worth, if not the value of his work which we. the people, should establish by biannual balloting since there is no market of governors from which we might select another. Hey, let’s go for broke and make it 300% — but no overtime or health insurance. He should be able to cover the latter out of his exorbitant salary. And as far as overtime goes, doesn’t Doug so love his work that, like the rest of us, he needs no incentive to work 60-70 hour weeks. Lastly, no state car and no guaranteed vacations: he can bargain with us for them, as he would ask each worker to do. My probable answer’s “No,” but i’m open-minded. Maybe if he’ll give back a half-dozen holidays…. This is a switch as the Governor shows his true colors. He supports big government and crony-capitalism rather than the free market. In a non-socialist, free market, the minimum wage is $0.00 and, with a minimally regulated economy, folks move through their first low paying jobs to higher paying ones having gained experience. Employers don’t pay workers out of the goodness of their hearts but their own self interest: is the value of the worker equal or less than the value of the customer. This does not surprise me at all. And, if the scalawag gov does. I won’t be able to hire the people needed for my SMALL business to grow and will in fact have to tell the one part timer I have now sorry the business can’t afford you any longer. Lack of revenue is going to shrink for me as well as a lot of what I do requires TWO people. Am I to tell the customer, Sorry you will need to do some of the work. And, I am so glad that the people will see that this gov is actually a liberal wearing the mantle of republican. Mikekapic and noman, you do realize that the whole point of this wage increase is to prevent cities like tempe tucson flag and phoenix from going higher in 12 to 15 range, which would de facto push the entire state wage higher? And also unions are gathering signatures to get a ballot initiative to take state min wage to 12. Ideally Ducey would support 0 min wage, but we dont live in an ideal world. Our 2006 law needs fixing and can only be corrected at the ballot per state law, and that wont happen unless free marketeers accept a compromise that voters will approve. Dish, what have you got against underpaid workers making incremental wage gains? Do you want a lowest common denominator economy? That we have already. There are two obvious solutions: (1) provide a product and/or service for which your customers are willing to pay a higher price or (2) profit-share with your half-time employee, as a way of incenting greater productivity while meeting minimum-wage standards. AZ’s minimum wage is already among the nation’s lowest. Unfortunately for those who profit from others’ inadequate compensation, slavery in America was banned following the Civil War and today is illegal everywhere in the world, though anti-slavery laws are still irregularly enforced … even here in AZ. Sol- per your comments I’ve never met an underpaid or enslaved worker in America- employment has been voluntary for over 100 years. Work hard and move up its the American way and has lifted generations out of poverty. Don’t like your job?- Quit and get a new one. Cant find a better job?- learn a new skill and try again. Can find a new job and too lazy to get a new skill- get used to a job that is beneath your expectations. Supply and demand Sol, its pretty easy to understand once an individual starts taking personal responsibility for their success and stops trying to scapegoat crony capitalists, lowest common denominator economy, etc.